People are starting to recognize the benefits of hawthorn herb. Myblossom or haw are other names for this medicinal herb and it is known to help with various conditions that affect the body. It has been used for thousands of years by Native Americans, Asians and Europeans as a remedy for heart illness and it is still used today for that reason. The hawthorn herb comes from the crataegus cucculenta or the hawthorn tree. The tree can reach up to fifteen feet in height and it produces blooms in the spring. These blooms are smaller type flowers with five petals, which are the same size. The flowers are a white to light pink color and they are accompanied in the fall by small fruit that resemble tiny apples. There is one distinct feature when it comes to the hawthorn tree. It has long thorns that are pointy and not flexible and can injure a person that reaches inside the plant. The leaves of the hawthorn are edible and make a tasty addition to salads. This fruit is used in making jellies and sauces but most people use it as a natural herb to enhance health. Herbalists claim that the hawthorn herb extract can help people suffering with heart issues. 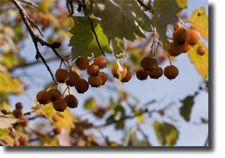 Hawthorn herb has been known to help people who suffer with congestive heart failure. But it also helps with other cardiovascular conditions. Flavonoids and proanthocyanidins are found in the herb and they aid the body with blood flow and oxygen. They increase the hearts abilities to dilate the blood vessels leading to the heart and they can also strengthen heart muscles. Phytochemicals that are also present in the hawthorn herb and they protect the heart from oxidation. The converting enzyme angiotensin that causes high blood pressure is known to be stopped by hawthorn herb. Because of all of its benefits to the heart, herbalists claim that the hawthorn herb works better than drug digitalis and has less side affects. But this is not intended for people who have extreme heart problems. It is only intended for people who are in the early stages of heart disease. People who are suffering with heart issues should see a cardiologist immediately and never rely on herbal remedies alone. When it comes to skin inflammation, hawthorn herb can also help. Since it helps to increase blood flow, inflammation can also be reduced. People who are suffering with skin conditions such as acne, psoriasis or rashes can benefit by using hawthorn herb. Just like with any drug, people who have any pre existing medical conditions should consult a doctor before using hawthorn herb. It has been known to interact with certain drugs in a negative way. For example, if you are using a decongestant for the sniffles, the hawthorn herb can counter act the effects of this medication. Or if you are taking a medication that is trying to constrict a blood vessel it will not work because hawthorn herb dilates the blood vessels. This herb also has some side effects. Nausea, extreme headaches and fatigue are the most common side effects of the hawthorn herb. If anyone taking this herb has these symptoms, it is recommended that they stop using it or lessen the dosage. Nausea and vomiting can deplete the body of water and nutrients and vitamins can be lost during this process. So never take any supplement that causes these symptoms. The FDA has never done testing on natural herbal remedies. There are no documented studies done on these types of remedies either. This does not mean that they do not work or are less effective than pharmaceutical drugs. But caution should be taken when using these types of herbs.